I am seeing this for the fourth time. People are enjoying the sea; people are trashing the sea. They are not aware of how their daily activities on the beach are harming the sea. People are disposing their garbage anywhere they like and throwing cigarette butts and food wrappers on the ground as if they own the land. And they do not have the slightest idea that this kind of activity may have dangerous impact on the plants and animals of our shores. This debris can also harm or kill beach organisms. Pollution also makes the beach less enjoyable for us. So why are we doing this? Instead of trashing the place we should be more careful of our activities. We are voting Cox's Bazar day and night but we are not showing any responsibility towards the place. Seeing the condition of the beach we (Kewkradong Bangladesh) first took the initiative to keep our coasts clean. 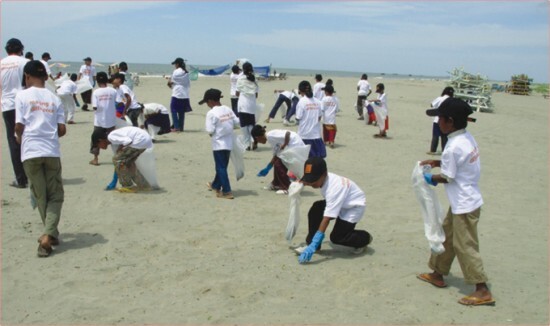 Thus the first International Coastal Cleanup 2006, Bangladesh began. 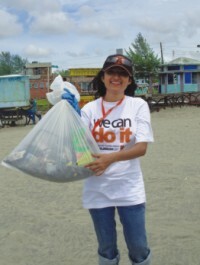 International Coastal Cleanup is the world's largest volunteer activity run by an organization named The Ocean Conservancy and Kewkradong Bangladesh. We collected around 30 types of marine debris that year and decided to make it an annual event. And the following year our team began to grow and we collected more and more marine debris from the Cox's Bazar sea beach. The most commonly found derbies were plastic, cigarette butts, food and candy wrappers, beverage bottles, balloons, toys, fish nets, clothing, bags, glass etc. Since 2006 we go to the beach every September with our volunteers and equipment and tried to collect debris and also tried to raise awareness among the people not to pollute the sea. This year's slogan was "Heal the ocean, Heal the world". The volunteers not only tried to collect and dump marine derbies but they also attempted to extend the message to the tourists and the inhabitants of the place. This year many students from different colleges and universities like Dhaka University, NSU, BRAC, EWU, and Stamford etc joined the cause and made this event more successful. Another attraction of this year's Coastal Cleanup was the participation of the famous band Artcell and a group of students who are visually impaired. Artcell and the group of blind students joined with the volunteers and helped them to clean the beach. They also entertained the volunteers in the award ceremony, which was chaired by the Deputy Commissioner of Cox's Bazar Giasuddin, who was delighted by the effort made by Kewkradong Bangladesh. In his speech he said," this kind of volunteer activity for saving the beach can make the beach more beautiful and enjoyable". And I personally do believe, it is time for a change now; if we all act's together then we can make the worlds largest coastal area the greatest place of earth.